Which plastic materials are recyclable? Home/Informational Post, Mentor Nuggets, Recycled Plastic/Which plastic materials are recyclable? Over the last 50 years or so since plastic became more and more prevalent, over one billion tons of it has been disposed of and that number only continues to grow. Plastic, because of its molecular structure does take along time to decompose and cannot be burned due to it releasing harmful toxins and pollutants into the air. However since the mid 1990’s, plastic recycling has become more advanced and a greater awareness has been established. Since this time though, new technologies have been implemented making it easier to recycle and making people more conscious to do so. Curbside containers and designated recycling stations have vastly improved the way we dispose of these materials. These programs helped pave the way for a new era where plastics are less likely to be littered on the side of the road and to make it easier to be reused over and over again saving money, energy and helping the environment. Polyester or PET carries the number 1 symbol. This plastic is primarily used for soft drink bottles. It is the easiest to recycle plastic and can be reground and reused time and time again. 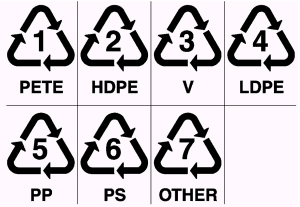 The plastic with the number 2 symbol on it is HDPE which is a plastic primarily used for grocery bags, milk jugs and laundry detergent bottles. PVC has the number 3 symbol and is used for pipes, fences and non-food containers. LDPE is number 4 and is used for tubing, caps, rings and shrink wrap (coffee can lids). Polypropylene has the number 5 symbol and its uses are for automotive parts, food containers and dishware. Polystyrene is number 6 and is used for food containers and cups (including Styrofoam). 7 is other material such as Acrylic, fiberglass and Polycarbonate. These plastics are used for lenses, glasses and shields. ABS is the number 9 symbol and is used in automotive, model building and molded parts. Many schools and organizations work to collect and recycle materials, including plastics and aluminum cans. The biggest problem with plastic recycling is that it needs to be so meticulously carried out and requires painstaking time to sort properly and to go through the plastics. This is why the resin identification coding system was implemented in 1988 to help better identify plastics. The number in the middle has no real significance and is just there to help name the plastic the item is made from. This system has greatly improved the way plastics are handled and recycled leading to greater efficiency and better consistency when sorting through plastic resins. There are, however, some plastics that cannot be recycled. These plastics are called thermosets, which are plastics that cannot return to their original form. The best example of this type of plastic is Phenolic which was the first commercially available plastic back in 1907, and was originally called Bakelite. It is primarily used for electrical and mechanical purposes. Unlike thermoplastics which can be formed and returned to their original shape, thermosets cannot due to their chemical makeup and they frequently have additives or fillers. Thermosets form above the melting temperature so when they are heated, the decomposition temperature is reached before the melt point. Many of these thermoset materials replace other, much more expensive materials, and generally out last the former material by as much as 20 times. In practice, these material reduce the usage of natural resources and the ‘carbon footprint’ used to produce the items. One such material is the Nylon bushings used in large ships. The Nylon replaces a large Bronze bushing that used to be replaced once a year, and required the ship be put into dry dock to remove and replace the bushing. The new Nylon bushings out perform the bronze, and will last over 12 times longer. Dramatic savings in materials, casting new bronze bushing and the loss of sailing time of these ships. Thanks to recycling improvements in the last 25 years, recycling has become much more efficient. Because of these programs better care has been taken to insure that plastic is not littered or discarded lightly, and that the programs created are easily accessible so people can take better care of their trash and better care of the earth. Plastics manufacturer commonly work to reuse and recycle materials during production. Many materials are available as ‘reprocessed’ or ‘commercial grade’ materials, meaning they contain a percentage of material that has been processed before. The first time a plastic resin is sent through the manufacturing process, that resin is referred to as ‘virgin resin’. Any further processing, the material must be referred to as reprocessed. Want more information on the recycling of plastics, click here for recycling information. You may also contact us if you have a specific material question at: 866-832-9315, we are happy to assist.